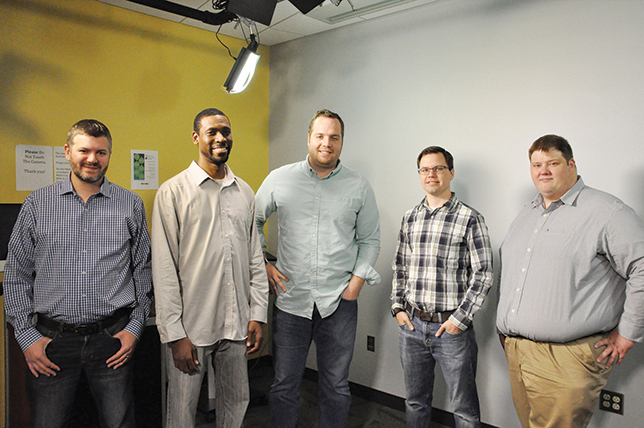 Penn State's One Button Studio has changed the meaning of "video literacy," giving students and instructors the tools to create professional-looking videos without technical assistance. Video is an increasingly important means to communicate information. To some, it's a given — an expected format in which to receive information and instruction. But the phrase "send me a video" has all too often struck terror in the hearts of those asked to create one: "I've never made a video before ... I don't have that kind of equipment or the funds to buy it ... The quality is going to be so poor ... I'll fumble around too much with all those controls ... I don't know how to get the file in the right format ... Who am I going to get to help me?" But since instructional technologists in Education Technology Services at Penn State University developed and implemented the One Button Studio, they can counteract all those fears with one simple question: "Do you own and know how to operate a thumb drive?" One Button Studio is just that simple: You walk into the studio and plug in your thumb drive, which triggers the lights to come on and all the equipment to start up, ready for recording. Get your mind on your presentation and your toes on the mark. Hit the big silver button when you want to begin ... and again when you want to end. Thoughtfully designed studio presets assure a high-quality recording and the most bang for the buck from single-camera-angle recording. While there's nothing new about recording studios, the One Button Studio has broken new ground with its foolproof simplicity and rock-solid dependability. Now any student, professor or staff member can successfully produce videos with absolutely no technical assistance. The developers of the One Button Studio set out to make every detail automatic, so that users can concentrate on their content and learning objectives. 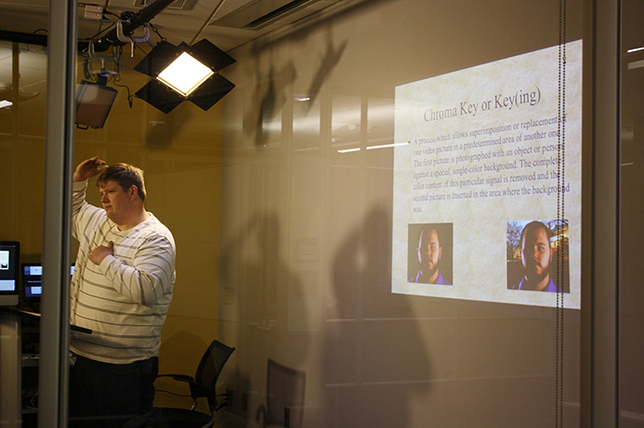 Slides and PowerPoint presentation elements can be brought in on the thumb drive and easily incorporated with the recording — they will appear on the screen next to the presenter. The system will automatically download the finished recording to the user's thumb drive in compressed MP4 format, even checking ahead for any potential space issues. Simply removing the thumb drive shuts off the lights and readies the studio for the next user. Project lead Justin Miller, a project manager for advanced learning projects at Penn State, comments on the project's success: "The most exciting part about One Button Studio is its sheer impact. We went from having about 80 users a year in our traditional video studios to up to 4,500 students per semester using the One Button Studio — that's more than 10 percent of the available student body. We are only able to do this because the studio is so easy to use; there is virtually no training needed." Usage of the One Button Studio has grown much faster than anticipated since its introduction as a modest pilot and prototype back in late 2010. Penn State currently operates 18 One Button Studios across its own campus, and in late 2014, the project staff shared the technology more widely with the release of the studio application as a free download on the Mac App store. More than a hundred universities, libraries, K-12 districts and other organizations are considering the prospect of running their own One Button Studios. Ohio State, the University of Nebraska and Notre Dame are among those institutions that have already implemented instances of the studio. To help technologists at other institutions who might implement the application, Penn State developers have created an iBook that contains technical details about the application with a listing of compatible hardware (not intended for the end users, who don't need to be concerned with platform or component details); they also started an online support community. 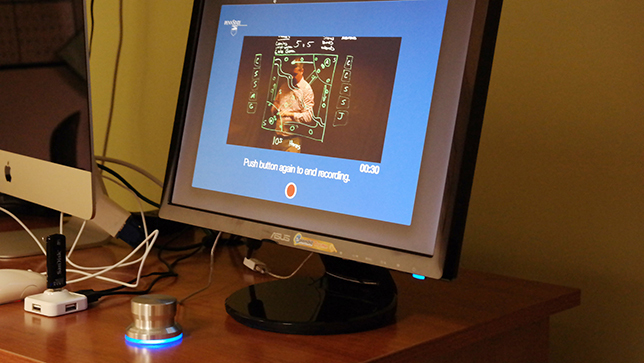 If they choose, developers on other campuses may run the One Button Studio app but find appropriate alternatives for most of the third-party technology; the only piece beyond the Macintosh computer platform that's presently specific to the application is the Blackmagic H.264 Pro Recorder (a recorder/encoder from Blackmagic Design). Other key elements include a Canon camera, a PowerMate USB button from Griffin Technology, lighting automation control technology from Indigo Domotics, lighting automation control modules by Insteon and a green screen from Reflecmedia. The project team at Penn State is excited about the interest in the One Button Studio at so many institutions. But the impact and potential of the One Button Studio is felt as more than just a number. In use at Penn State, it has changed the meaning of "video literacy" — students and instructors can be less concerned with technical details, free to concentrate more on their content and on their use of video for learning. Instructors may experiment with new course designs, and students may experience the challenge of expressing their ideas through video — or anyone might use their recording as a tool to help them practice for an upcoming live presentation. Video production can now be sensibly leveraged as an important part of learning design. And at last, video can be a more natural part of academic conversations and information exchange.